Mr Mulligan's Pirate Golf at Junction 32 Outlet Shopping Village01977 550030 work Pitch & Putt/Crazy GolfMr Mulligan's Pirate Golf is unlike any other crazy golf course you have ever played before. Choose between two 18-hole adventure golf courses, festooned with obstacles, or better still play both! Tackle a giant octopus, cross crocodile infested waters by raft, escape from Buccaneers Jail and visit the Ruined Fort, all on your voyage through Skull Cove and Smugglers Bay. Pirate Golf is serious fun for the whole family from weathered old seadogs to young scallywags and stowaways. 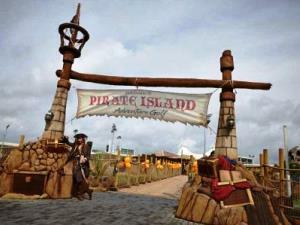 Mr Mulligan's Pirate Golf is unlike any other crazy golf course you have ever played before. But keep your eyes peeled and your wits about you… there are many dangers which may scupper your quest. 10am - 8pm Monday - Friday. Last entry 45 minutes before close. Located in Glasshoughton, just off M62 Junction 32. Free car parking is available on site.